Those Styrofoam cups and plates you used at your 5th birthday party will still exist when your great, great grandchildren are walking the Earth. But there are alternatives, like the new packaging created by Ecovative Designs. We are all familiar with the cheap squeaky packages we’re used to receiving our takeout lunch and sodas in. the Styrofoam packaging is one of the most common packaging in the world. The problem with Styrofoam, or expanded polystyrene foam, is that it is a plastic that often gets thrown out car windows or left in the park after a picnic, eventually passing through storm drains and into the ocean waters. It is the second most common product littered on beaches. it is littered in excessive quantities in numbers that are quite alarming, but also the fact that it takes hundreds of years to biodegrade, makes it an enemy of the environment. It breaks down into smaller and smaller pieces over time, similar to rocks turning into sand. Those Styrofoam cups and plates you used at your 5th birthday party will still exist when your great, great grandchildren are walking the Earth. But there are alternatives, like the new packaging created by Ecovative Designs. The new EcoCradle Mushroom Packaging uses mycelium and agricultural crop byproducts to create packaging that is non-toxic to humans, completely biodegradable and 100% natural. The EcoCradle packaging is grown with mycelium, a fungal cell combination that, when mixed with byproducts such as oat hulls or buckwheat husks, grows into efficient packaging material without the use of chemicals, water or sunlight. Once the packaging has developed, in just 5 to 7 days, it is treated with heat to prevent future growth and sealed into packing parts. If you’re thinking nobody would actually use this, think again. Dell is trying it out to transport their servers, which can weigh as much as 45 kilos. The strong and durable packaging is completely renewable and biodegradable, so the potential Styrofoam and plastic replacement won’t be sitting in a landfill for hundreds of years, and it won’t be seeping chemicals into the Earth. It’s created through the use of agricultural waste that would otherwise be thrown away, so no additional land is required for harvesting. 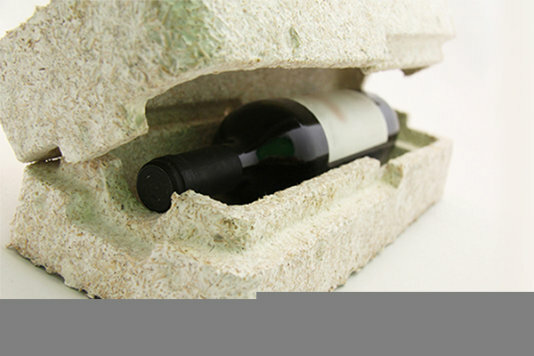 But the best part of the EcoCradle packaging is that it can actually be grown into whatever shape is desired.